Thinking of buying in the future? Enter your email and we’ll notify you of any special offers and new product lines. As we approach the busiest time of year in the stove and fires calendar, we continue to expand upon our range of quality Wood Burning and Multifuel stoves both online and in our High Street showroom. This week alone we have introduced the popular high-efficiency Ekol and Saltfire stove ranges, and to continue this trend we are pleased to announce that we are now authorised distributors for the British made Arada Stoves range. This beautiful new range of stoves is available for order now both online and through our showroom. The Arada Ecoburn Plus 5 Widescreen, Arada Farringdon Small Eco with Pedestal and Arada i600 Freestanding stoves can be seen on display in our High Street showroom, with the popular Farringdon model on live display. We are currently running a 15% discount on the full Arada range, and throughout August enter code 5MORE to receive an additional 5% discount with any Arada order placed. The Arada Stratford Ecoboiler Wood Burning Stove is a dedicated Wood Burning only model and features one of the largest glass viewing windows in the Arada stoves range, providing an unhindered view of its glowing fire within. Offering a modern design, clean-cut lines and a sleek operating handle, this powerful wood burning boiler stove is the perfect centrepiece for any energy-conscious home owner. 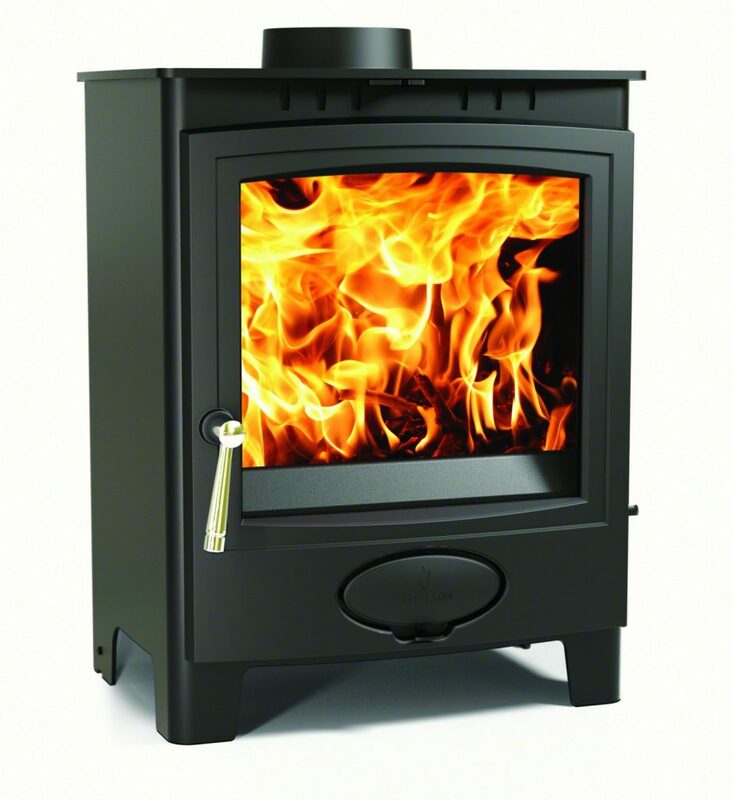 Features include a pre-heated Airwash System, Flue Exhaust Diversion System for improved performance, Direct Air Supply compatibility and the suitability for installation into an indirect/open-vented or sealed central heating system, the Arada Ecoboiler Wood Boiler Stove is an impressive choice. Each Arada Ecoboiler Wood Boiler Stove comes complete with a 7-Year manufacturer backed guarantee as standard, which is testament to the build quality of these fantastic fires. The Arada Stratford Ecoboiler 16 HE Inset Multifuel Stove provides high efficiency whilst fitting perfectly into a standard British fireplace opening. Featuring a large curved viewing glass window, simple easy-to-use controls and the ultimate in state-of-the-art boiler stove technology, the Arada Ecoboiler 16 HE Inset Stove will transform any fireplace with its sophisticated style. The Arada Ecoboiler 16 HE Multifuel Inset Boiler Stoves can be used to burn both Logs and Smokeless Fuel and have built in technology such as a pre-heated Airwash System, Easy Boost System and Flue Exhaust Diversion System to improve performance and to keep your home warm and cosy. Each Arada Ecoboiler 16 HE Multifuel Inset Boiler Stove comes complete with a 7-Year manufacturer backed guarantee as standard, which is testament to the build quality of these fantastic fires. The Arada Stratford Ecoboiler 12 HE Inset Multifuel Stove provides high efficiency whilst fitting perfectly into a standard British fireplace opening. Featuring a large curved viewing glass window, simple easy-to-use controls and the ultimate in state-of-the-art boiler stove technology, the Arada Ecoboiler 12 HE Inset Stove will transform any fireplace with its sophisticated style. The Arada Ecoboiler 12 HE Multifuel Inset Boiler Stoves can be used to burn both Logs and Smokeless Fuel and have built in technology such as a pre-heated Airwash System, Easy Boost System and Flue Exhaust Diversion System to improve performance and to keep your home warm and cosy. Each Arada Ecoboiler 12 HE Multifuel Inset Boiler Stove comes complete with a 7-Year manufacturer backed guarantee as standard, which is testament to the build quality of these fantastic fires. The Arada Stratford Ecoboiler 12 HE Multifuel Cassette Stove offers the perfect combination of contemporary style and traditional boiler stove heating. The Ecoboiler 12 Inset stove offers an alternative to the Arada freestanding models with a wide viewing glass window and modern look, which is combined with the latest state-of-the-art technology and high performance. With features such as a pre-heated Airwash System, discreetly positioned thermostatic control, externally controlled riddling grate and direct air supply as standard, the Arada Ecoboiler 12 Multifuel Inset Cassette Stove is sure to provide an ideal heating solution for your home and hot water. Each Arada Ecoboiler 12 Multifuel Inset Boiler Stove comes complete with a 7-Year manufacturer backed guarantee as standard, which is testament to the build quality of these fantastic fires. Providing more than just superior performance, the Arada Stratford Ecoboiler 25 HE Multifuel Stove features a large fire door glass and soft curved lines, offering an attractive focal point for any living area. The Arada Ecoboiler 25 HE can be used to burn both Logs and Smokeless Fuel and have built in technology such as a pre-heated Airwash System, Easy Boost System and Flue Exhaust Diversion System to improve performance and to keep your home warm and cosy. On top of the Ecoboiler 25 HE stoves stylish appearance, discreet thermostatic control and three bar operating pressure, its ability to produce 50% more heat to water than other boiler stoves ensure that the Arada Ecoboiler HE stove is the ultimate heating companion. Each Arada Ecoboiler 25 HE Boiler Stove comes complete with a 7-Year manufacturer backed guarantee as standard, which is testament to the build quality of these fantastic fires. Providing more than just superior performance, the Arada Stratford Ecoboiler 20 HE Multifuel Stove features a large fire door glass and soft curved lines, offering an attractive focal point for any living area. The Arada Ecoboiler 20 HE can be used to burn both Logs and Smokeless Fuel and have built in technology such as a pre-heated Airwash System, Easy Boost System and Flue Exhaust Diversion System to improve performance and to keep your home warm and cosy. On top of the Ecoboiler 20 HE stoves stylish appearance, discreet thermostatic control and three bar operating pressure, its ability to produce 50% more heat to water than other boiler stoves ensure that the Arada Ecoboiler HE stove is the ultimate heating companion. Each Arada Ecoboiler 20 HE Boiler Stove comes complete with a 7-Year manufacturer backed guarantee as standard, which is testament to the build quality of these fantastic fires. Providing more than just superior performance, the Arada Stratford Ecoboiler 9 HE Multifuel Stove features a large fire door glass and soft curved lines, offering an attractive focal point for any living area. The Arada Ecoboiler 9 HE can be used to burn both Logs and Smokeless Fuel and have built in technology such as a pre-heated Airwash System, Easy Boost System and Flue Exhaust Diversion System to improve performance and to keep your home warm and cosy. On top of the Ecoboiler 9 HE stoves stylish appearance, discreet thermostatic control and three bar operating pressure, its ability to produce 50% more heat to water than other boiler stoves ensure that the Arada Ecoboiler HE stove is the ultimate heating companion. Each Arada Ecoboiler 9 HE Boiler Stove comes complete with a 7-Year manufacturer backed guarantee as standard, which is testament to the build quality of these fantastic fires. 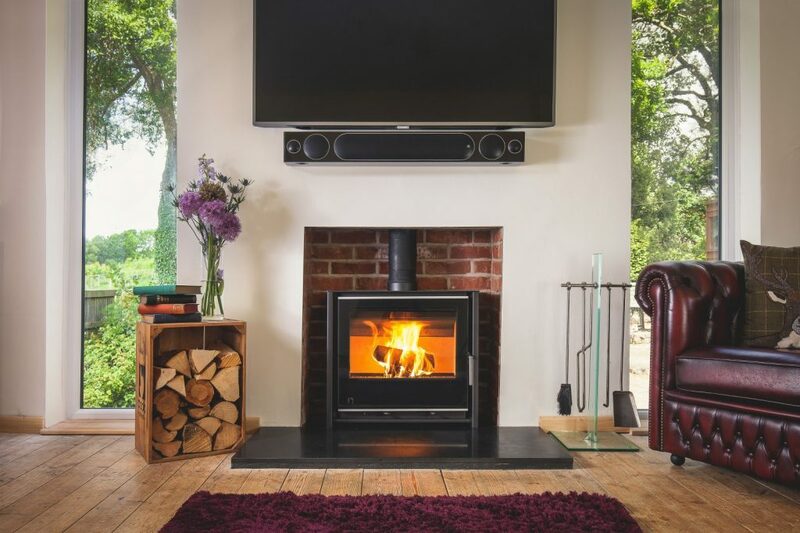 The newly improved, sleek and cutting-edge design of the Arada Aarrow i750 Multifuel Inset Cassette Stoves make these beautiful fires the perfect choice for the modern, energy conscious home owner. Featuring an almost fully glass fronted door, the i Series offers a stunning view of the flames within. With features such as a pre-heated airwash system to help keep this large glass clean, and both radiant and convected heat distribution for maximum efficiency, the i Series are the perfect choice when looking for a modern inset stove. 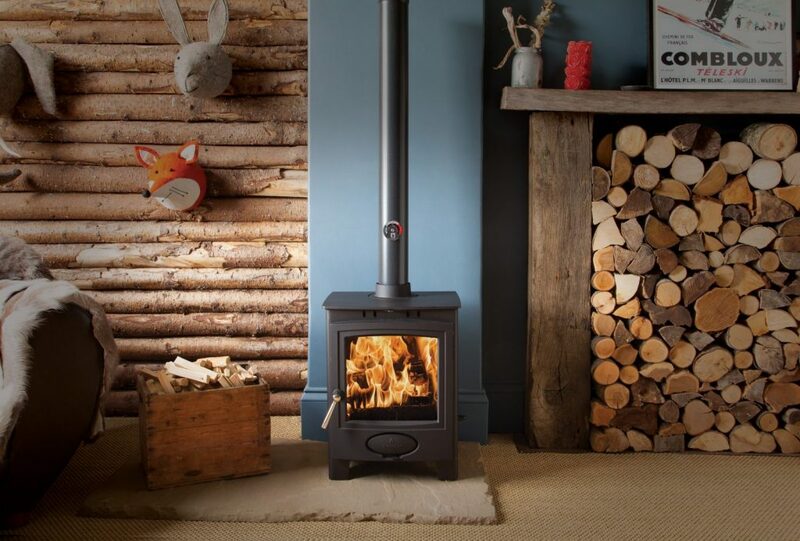 Each i750 Series Cassette Stove comes complete with a Lifetime manufacturer backed guarantee as standard, which is testament to the build quality of these fantastic fires. The newly improved, sleek and cutting-edge design of the Arada Aarrow i600 Multifuel Inset Cassette Stoves make these beautiful fires the perfect choice for the modern, energy conscious home owner. Each i600 Series Cassette Stove comes complete with a Lifetime manufacturer backed guarantee as standard, which is testament to the build quality of these fantastic fires. The newly improved, sleek and cutting-edge design of the Arada Aarrow i500 Multifuel Inset Cassette Stoves make these beautiful fires the perfect choice for the modern, energy conscious home owner. Each i500 Series Cassette Stove comes complete with a Lifetime manufacturer backed guarantee as standard, which is testament to the build quality of these fantastic fires. 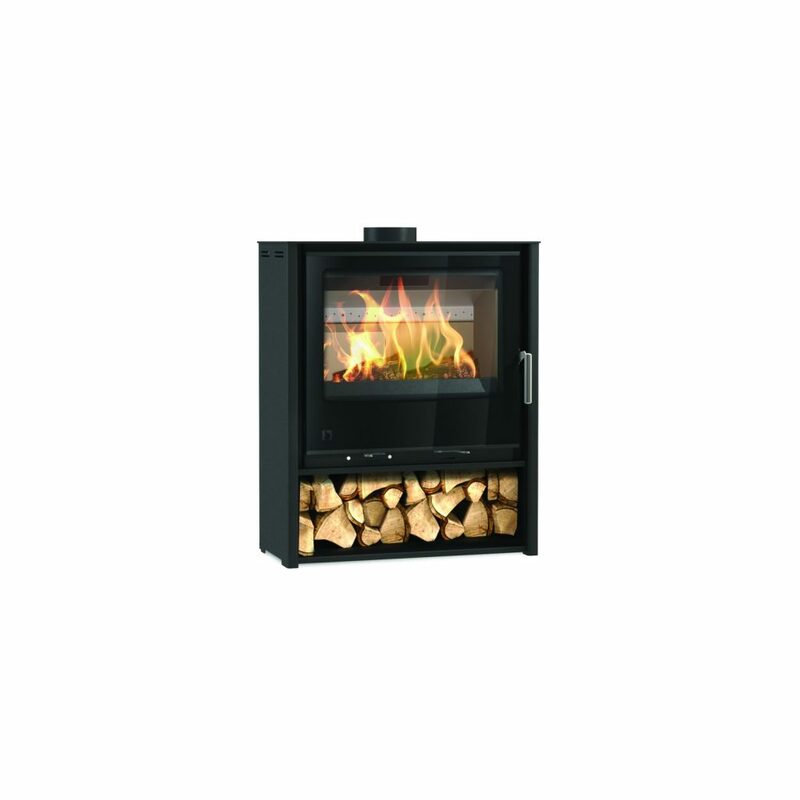 The i500 Cassette is also a Defra Approved Appliance for use within Smoke Controlled Areas, meaning that a clean efficient burn is guaranteed when using Kiln Dried Logs and Smokeless Fuel. The newly improved, sleek and cutting-edge design of the Arada Aarrow i400 Multifuel Inset Cassette Stoves make these beautiful fires the perfect choice for the modern, energy conscious home owner. Each i400 Series Cassette Stove comes complete with a Lifetime manufacturer backed guarantee as standard, which is testament to the build quality of these fantastic fires. The Arada Aarrow i600 Slimline Freestanding Mid Multifuel Stove is the perfect choice for large fireplace openings where a modern, contemporary style is desired. Or perhaps as a Freestanding unit to create a stunning feature within a modern room setting. The slimline body helps to reduce the Kilowatt output of this beautiful stove down to the popular 4.9kW range, making this stove suitable for a range of applications. Featuring a pre-heated airwash system to aid glass cleaning and a two-position door mechanism to assist cold lighting, the i600 Freestanding Mid stove is certain to make an impressive centrepiece within your home. 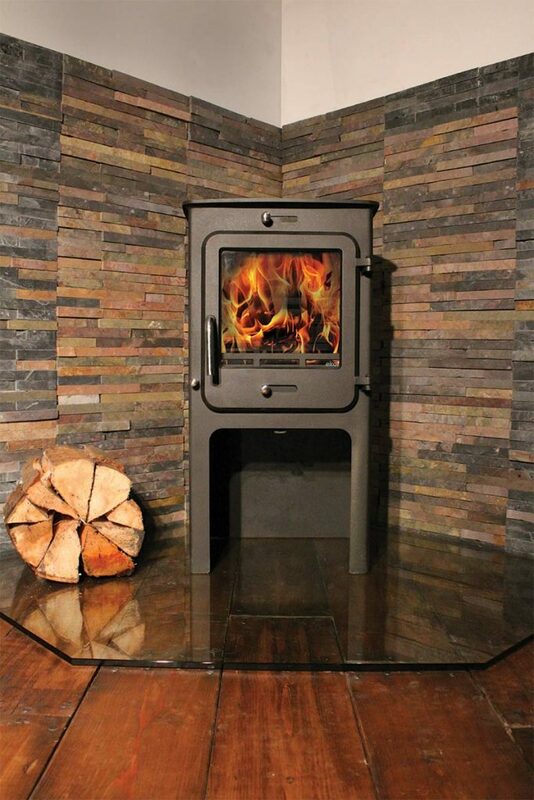 An under stove log storage compartment is included with the i600 Mid stove, which offers both function and style. The i600 is also a Defra Approved Appliance for use within Smoke Controlled Areas, meaning that a clean efficient burn is guaranteed when using Kiln Dried Logs and Smokeless Fuel. The Arada Aarrow i600 Slimline Freestanding Low Multifuel Stove is the perfect choice for large fireplace openings where a modern, contemporary style is desired. The slimline body helps to reduce the Kilowatt output of this beautiful stove down to the popular 4.9kW range, making this stove suitable for a range of applications. Featuring a pre-heated airwash system to aid glass cleaning and a two-position door mechanism to assist cold lighting, the i600 Freestanding Low stove is certain to make an impressive centrepiece within your home. 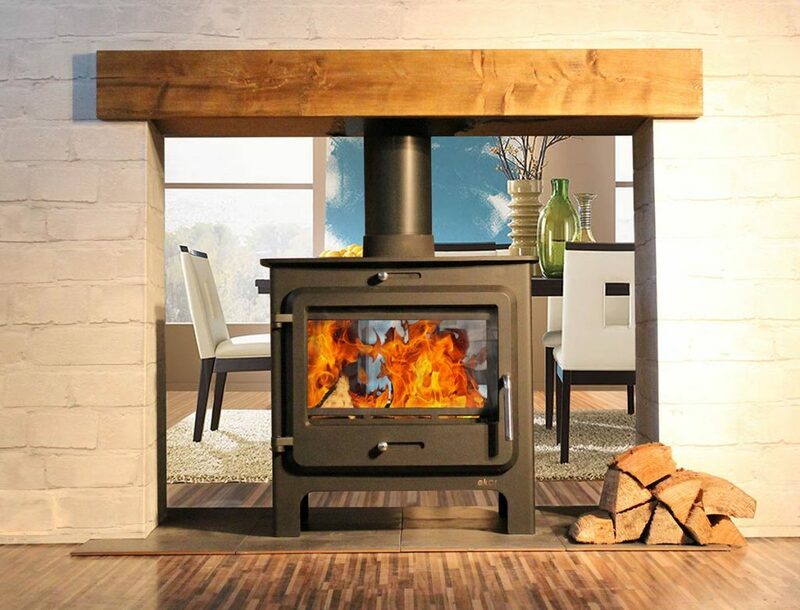 The Arada Aarrow Ecoburn Conventional Flue Natural Gas Stove is supplied with a hand-held safety remote control as standard and has a battery powered ignition, which means there is no need for an electrical connection. With an adjustable heat output and flame height, the Ecoburn Gas Stove includes a Lifetime manufacturer backed warranty as standard, which is testament to the build quality of this British made stove. The Arada Aarrow Ecoburn Plus 7 Inset Multifuel Stove has been designed to provide a convenient solution for converting an open fire into a high-performance fireplace. Complete with the same large viewing window and clean lines as the Ecoburn Plus freestanding models, the Ecoburn Plus Inset stove is a perfect solution for smaller fireplace openings. 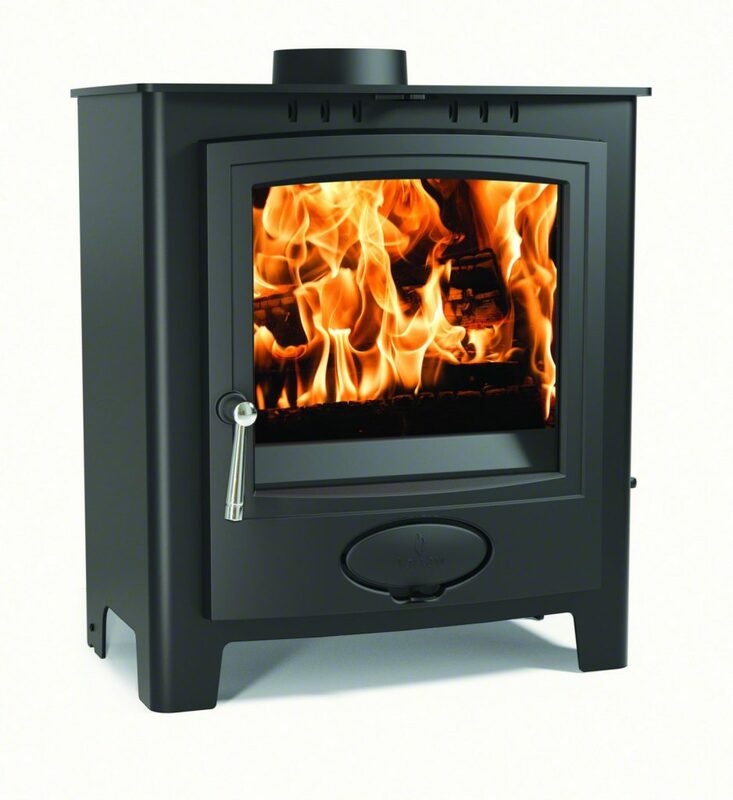 Featuring a powerful 6.1kW in heat output, the Ecoburn Plus 7 Inset is ideally suited to larger rooms. The Arada Ecoburn Plus 5 Inset stove comes with a Lifetime manufacturer backed guarantee as standard, which is testament to the precision build quality associated with Arada stoves. The Arada Aarrow Ecoburn Plus 5 Inset Multifuel Stove has been designed to provide a convenient solution for converting an open fire into a high-performance fireplace. Complete with the same large viewing window and clean lines as the Ecoburn Plus freestanding models, the Ecoburn Plus Inset stove is a perfect solution for smaller fireplace openings. 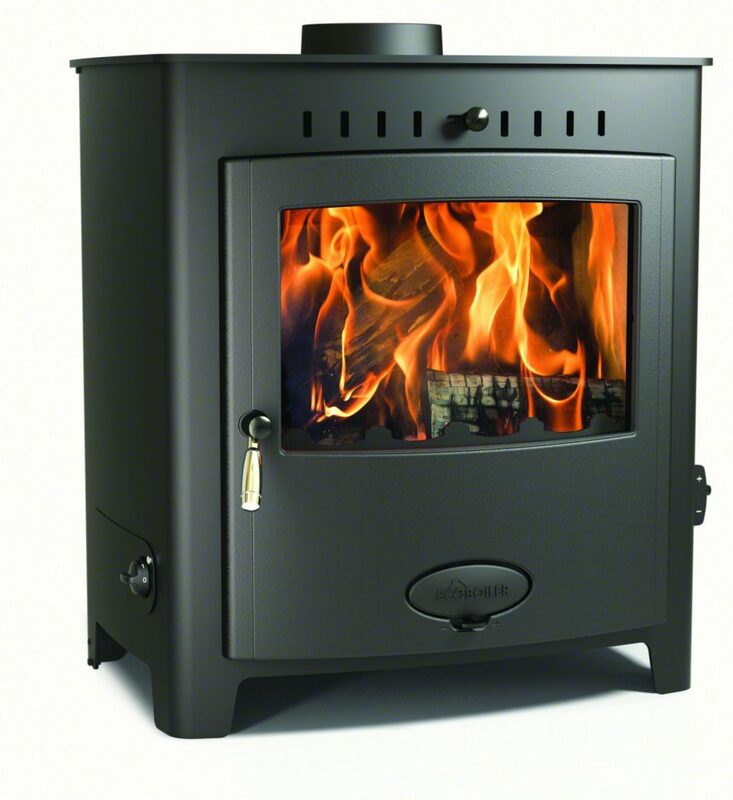 Featuring an impressive 4.9kW in heat output, the Ecoburn Plus 5 Inset is ideally suited to smaller rooms. The Arada Aarrow Ecoburn Plus 11 Multifuel Stove is visually astounding, with an extensive viewing window offering a stunning view of the flames within. The Ecoburn Plus range of stoves provide outstanding efficiencies along with stylish features such as a pre-heated Airwash System for cleaner glass, externally controlled riddling grate and patented Flexifuel System. The largest model in the Ecoburn Plus range of fires, the incredibly powerful Ecoburn 11 stove offers an impressive 11kW of heat output which suited to the largest rooms and living areas. The Arada Ecoburn Plus 11 stove comes with a Lifetime manufacturer backed guarantee as standard, which is testament to the precision build quality associated with Arada stoves. The Arada Aarrow Ecoburn Plus 9 Multifuel Stove is visually astounding, with an extensive viewing window offering a stunning view of the flames within. The Ecoburn Plus range of stoves provide outstanding efficiencies along with stylish features such as a pre-heated Airwash System for cleaner glass, externally controlled riddling grate and patented Flexifuel System. The second largest model in the Ecoburn Plus range of fires, the powerful Ecoburn 9 stove offers an impressive 8.8kW of heat output which is capable of heating large family rooms. The Arada Ecoburn Plus 9 stove comes with a Lifetime manufacturer backed guarantee as standard, which is testament to the precision build quality associated with Arada stoves. The Arada Aarrow Ecoburn Plus 7 Multifuel Stove is visually astounding, with an extensive viewing window offering a stunning view of the flames within. The Ecoburn Plus range of stoves provide outstanding efficiencies along with stylish features such as a pre-heated Airwash System for cleaner glass, externally controlled riddling grate and patented Flexifuel System. This popular model in the Ecoburn Plus range of fires features a 6.1kW heat output, which is ideally suited to medium and large sized rooms. The Arada Ecoburn Plus 7 stove comes with a Lifetime manufacturer backed guarantee as standard, which is testament to the precision build quality associated with Arada stoves. The Arada Aarrow Ecoburn Plus 5 Widescreen Multifuel Stove lives up to its name, featuring a beautifully designed large glass viewing window. Whilst its flames are the centre of attention, the Ecoburn 5 Widescreen still offers the same 4.9kW in heat output as the standard Ecoburn 5 and includes features such as a pre-heated airwash system for cleaner glass, externally controlled riddling grate and patented Flexifuel System. The Ecoburn Widescreen is also approved for use within Smoke Controlled Areas, meaning that it has Defra Approval due to its low emissions. The Arada Ecoburn Plus 5 Widescreen stove comes with a Lifetime manufacturer backed guarantee as standard, which is testament to the precision build quality associated with Arada stoves. The Arada Aarrow Ecoburn Plus 5 Multifuel Stove is visually astounding, with an extensive viewing window offering a stunning view of the flames within. The Ecoburn Plus range of stoves provide outstanding efficiencies along with stylish features such as a pre-heated Airwash System for cleaner glass, externally controlled riddling grate and patented Flexifuel System. The most popular model in the Ecoburn Plus range of fires, the perfectly formed Ecoburn 5 stove offers an impressive 4.9kW of heat output and is also the only Multifuel Defra Approved model in the range for use within Smoke Controlled Areas. The Arada Ecoburn Plus 5 stove comes with a Lifetime manufacturer backed guarantee as standard, which is testament to the precision build quality associated with Arada stoves. The Arada Aarrow Ecoburn Plus 4 Multifuel Stove is visually astounding, with an extensive viewing window offering a stunning view of the flames within. The Ecoburn Plus range of stoves provide outstanding efficiencies along with stylish features such as a pre-heated Airwash System for cleaner glass, externally controlled riddling grate and patented Flexifuel System. The smallest in the Ecoburn Plus range of fires, this compact stove offers an impressive 4.5kW of heat output which is perfect for smaller rooms. The Arada Ecoburn Plus 4 stove comes with a Lifetime manufacturer backed guarantee as standard, which is testament to the precision build quality associated with Arada stoves. The Arada Farringdon Catalyst Eco Wood Burning Stove in Slate is the most efficient high output fire currently offered by Arada. Featuring an incredible 11.4kW in nominal heat output to the room (and a maximum heat output of 16kW), a testament to the quality of workmanship is that the Arada Farringdon Catalyst stove still complies with the Ecodesign Ready Scheme. The Arada Farringdon range epitomises the finest of British design with innovative technology, outstanding all-round performance and long burn times. Boasting impressive clean burning credentials, the complete Arada Farringdon range are Ecodesign Ready. Not only do they exceed the new 2022 European regulations, but also meet even stricter North American EPA low emission levels. With the ability to burn at low levels for more than 10 hours, the Farringdon features exceptional controllability alongside a large fire viewing glass. The Arada Farringdon Catalyst Eco Wood Burning Stove is SIA Ecodesign Ready. The Arada Farringdon Catalyst Eco Wood Burning Stove in Midnight is the most efficient high output fire currently offered by Arada. Featuring an incredible 11.4kW in nominal heat output to the room (and a maximum heat output of 16kW), a testament to the quality of workmanship is that the Arada Farringdon Catalyst stove still complies with the Ecodesign Ready Scheme. The Arada Farringdon Large Eco Multifuel Stove in Slate is a powerful, efficient and beautifully designed fire, offering an impressive 10.6kW in heat output. The Arada Farringdon range epitomises the finest of British design with innovative technology, outstanding all-round performance and long burn times. The Arada Farringdon Large Eco Multifuel Stove is SIA Ecodesign Ready. The Arada Farringdon Large Eco Multifuel Stove in Midnight is a powerful, efficient and beautifully designed fire, offering an impressive 10.6kW in heat output. The Arada Farringdon range epitomises the finest of British design with innovative technology, outstanding all-round performance and long burn times. The Arada Farringdon Medium Eco Multifuel Stove in Slate is a mid-sized, efficient and beautifully designed fire, offering an impressive 8.2kW in heat output. The Arada Farringdon range epitomises the finest of British design with innovative technology, outstanding all-round performance and long burn times. The Arada Farringdon Medium Eco Multifuel Stove is SIA Ecodesign Ready. The Arada Farringdon Medium Eco Multifuel Stove in Midnight is a mid-sized, efficient and beautifully designed fire, offering an impressive 8.2kW in heat output. The Arada Farringdon range epitomises the finest of British design with innovative technology, outstanding all-round performance and long burn times. 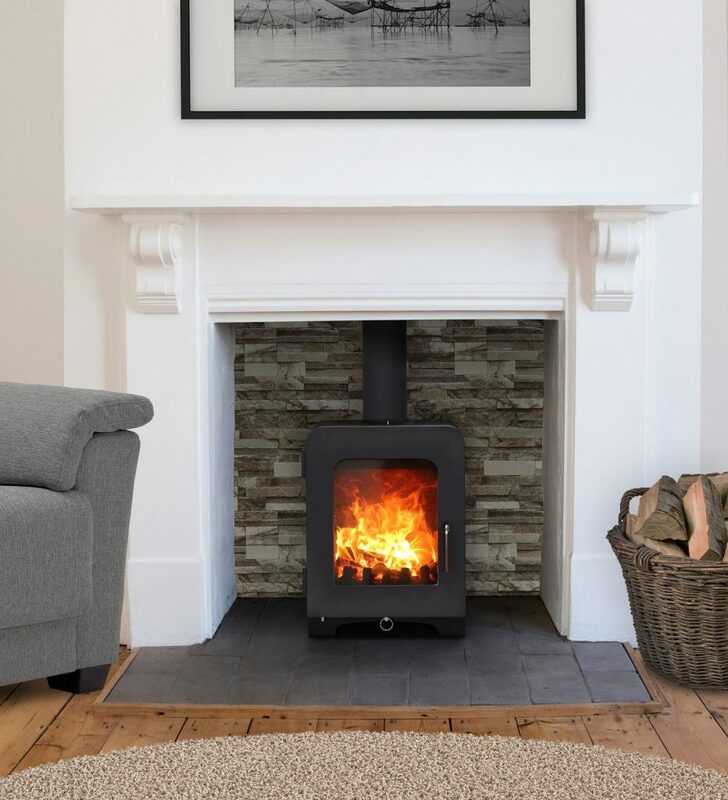 The Arada Farringdon Small Eco Multifuel Stove in Slate is a compact, efficient and beautifully designed fire, offering an impressive 4.9kW in heat output. The Arada Farringdon range epitomises the finest of British design with innovative technology, outstanding all-round performance and long burn times. The Arada Farringdon Small Eco Multifuel Stove is SIA Ecodesign Ready. 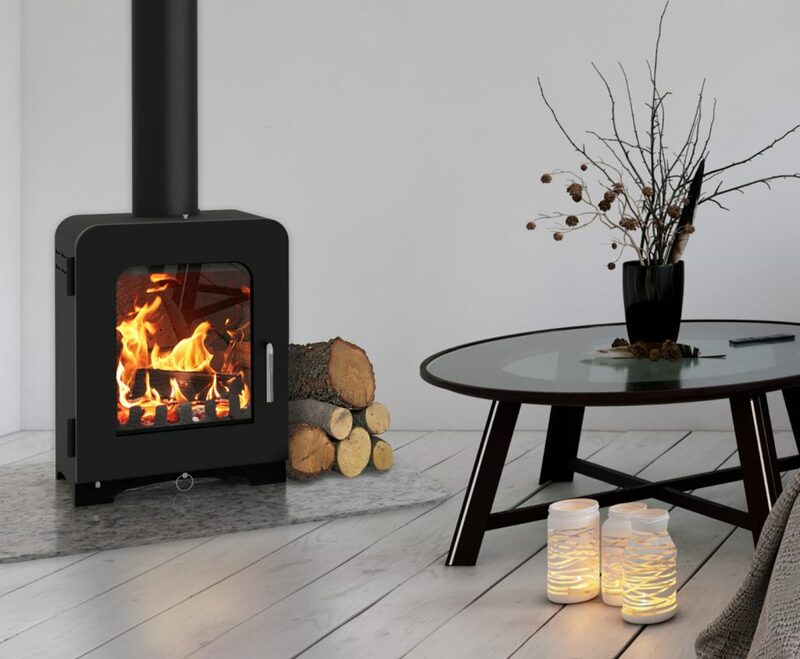 The Arada Farringdon Small Eco Multifuel Stove in Midnight is a compact, efficient and beautifully designed fire, offering an impressive 4.9kW in heat output. The Arada Farringdon range epitomises the finest of British design with innovative technology, outstanding all-round performance and long burn times. 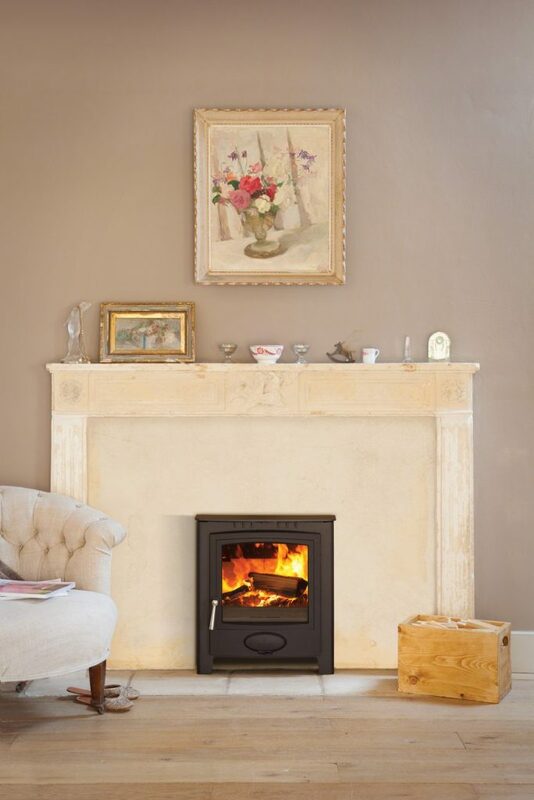 The Arada Villager Chelsea Duo Multifuel Stove is a dependable favourite within the Timeless Classics range. Featuring two doors this traditional styled 4.9kW stove feels at home in red-brick fireplaces and houses with character. A separate compartment is present below the firebox which collects the ash allowing easy cleaning even when the fire is roaring within. It’s tastefully chunky controls offer total ease of use, with the Primary and Secondary burn functions ensuring high efficiency at all times. The Arada Villager Chelsea Solo Multifuel stove is a popular favourite within the Arada Stoves Timeless Classics range. With its clean, simple design, large glass viewing window and advanced airwash system the Chelsea Solo proves a hardy companion on a cold Winters night. Featuring solid and easy to use controls, and a separate ash-pan compartment the Arada Villager Solo adds rural charm to any fireplace setting. The Arada Villager Heron 5 Multifuel stove is the second smallest model in the Arada Timeless Classics collection and is the perfect solution for smaller fireplace chambers and living spaces. 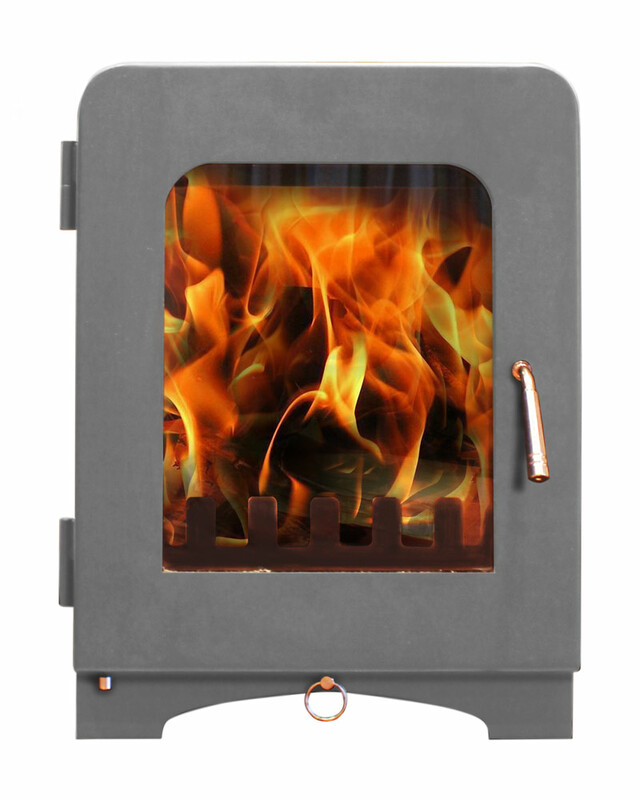 It’s slight increase In both width and height when compared to the Puffin 4 stove allows for a small increase in heat output into the room, and will suit small to medium fireplace chamber sizes. 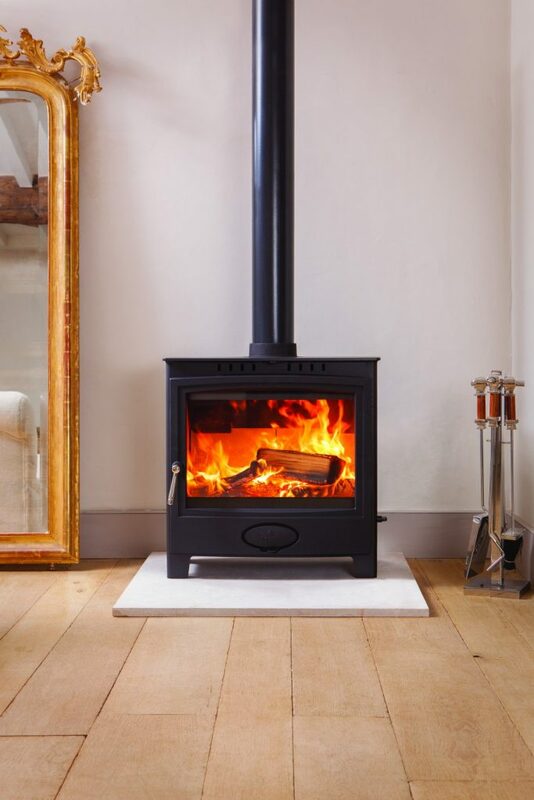 The simple, clean design of the Heron 5 stove means that it looks at home within a variety of room settings, and its compact size allows it to be installed when space is an issue. Each Arada stove is offered with a Lifetime Guarantee for complete peace of mind, which is a testament to the quality of workmanship involved with each stove produced in rural Devon. The Arada Villager Puffin 4 Multifuel stove is the smallest model in the Arada Timeless Classics collection and is the perfect solution for smaller fireplace chambers and living spaces. 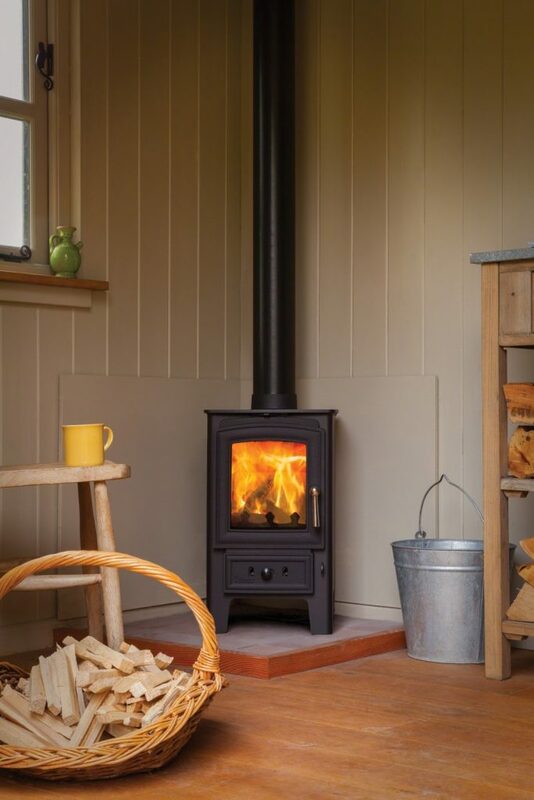 The simple, clean design of the Puffin 4 stove means that it looks at home within a variety of room settings, and its compact size allows it to be installed when space is an issue. Newly added to both our website and High Street showroom is the impressive range of clean burning Saltfire Stoves. Each model is designed with simple, easy to operate user friendly controls. Constructed using a triple-layer convection system, there is a precision engineered welded outer and inner steel body with thermo-refractory fire brick inner linings. While the advanced After-burner system to ensure an efficient burn within the large firebox. 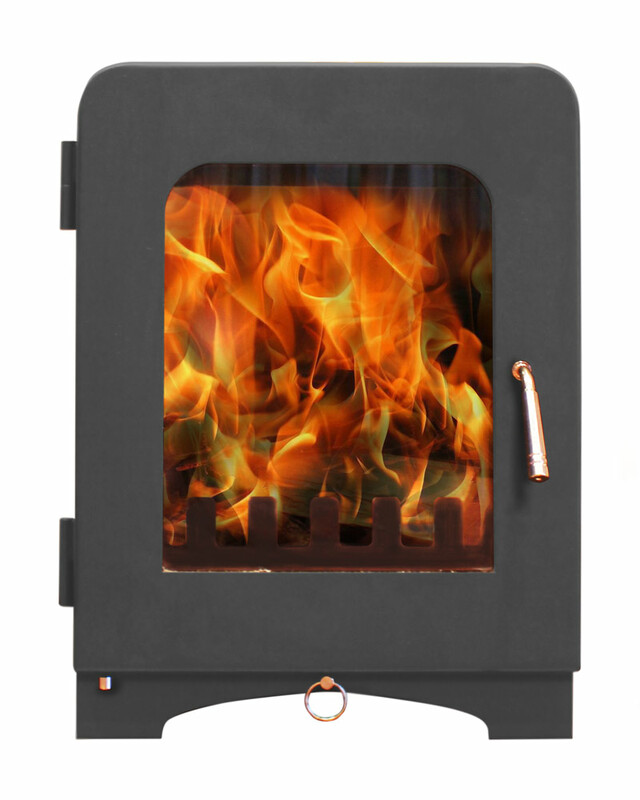 The new Saltfire ST1 Vision Wood Burning Stove is the larger door/widow version of the original Saltfire ST1 model. (while the stove dimensions and specification are the same, the larger window gives the best view of the fire). The result of thousands of hours of development, the Saltfire ST1 Vision is one of the most efficient and clean-burning stoves available on the market today, and can be purchased in a range of stunning colours such as Charcoal Grey, Light Grey and Mohave Red as well as the standard Metallic Black finish. The latest range offered by Saltfire Stoves is the ST-X, which are Ultra Clean Burning and feature exceptionally High-Efficiency burning. The Saltfire ST-X range are many times cleaner than the standard required for “DEFRA” exemption, and they can legally be used anywhere in the UK including the strictest of smoke control zones. Another advantage to choosing the new ST-X range is the ability to cleanly and efficiently burn Smokeless Coal as well as logs. 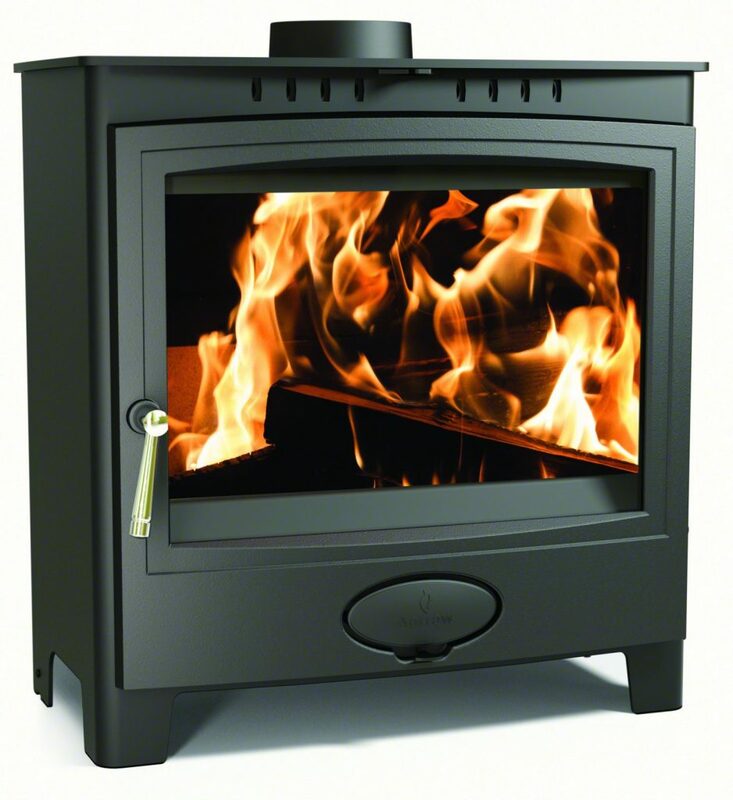 Each ST-X stove features a multifuel grate and removable ash-pan for easy cleaning. The Saltfire Stoves range are available for order now both online and in store at our High Street showroom. The range can also be viewed in our showroom for those wishing to view these fantastic stoves. Use code SALT5 for an additional 5% off the entire range until the end of August 2018. Add a unique look to your Saltfire ST-X Stove with a Burnished Door. The cast iron door is finished by hand with various polishing tools and abrasives to give a truly unique bare-metal look, then coated with a clear protective surface – no two are ever the same. Parts of the door over time will then change through many different hues of subtle blues and purples as the stove is heated. The result of extensive development, the Saltfire ST-X8 Multi Fuel Stove in Mohave Red is the largest in the ST-X range and is ultra-clean-burning with an efficiency rating of 80.5%. Constructed with a steel body and cast iron door, the ST-X8 also features the latest Air Wash technology to ensure the large glass window is kept clean and clear to allow views of the beautiful flames at all times. Designed with easy to use controls, the ST-X8 is DEFRA approved which means it can be installed into properties within Smoke Controlled areas safely and legally, and it is also EcoDesign ready to meet all 2022 regulations. The Saltfire ST-X8 Multi Fuel Stove is SIA Ecodesign Ready. The result of extensive development, the Saltfire ST-X8 Multi Fuel Stove in Light Grey is the largest in the ST-X range and is ultra-clean-burning with an efficiency rating of 80.5%. The result of extensive development, the Saltfire ST-X8 Multi Fuel Stove in Charcoal Grey is the largest in the ST-X range and is ultra-clean-burning with an efficiency rating of 80.5%. The result of extensive development, the Saltfire ST-X8 Multi Fuel Stove in Metallic Black is the largest in the ST-X range and is ultra-clean-burning with an efficiency rating of 80.5%. 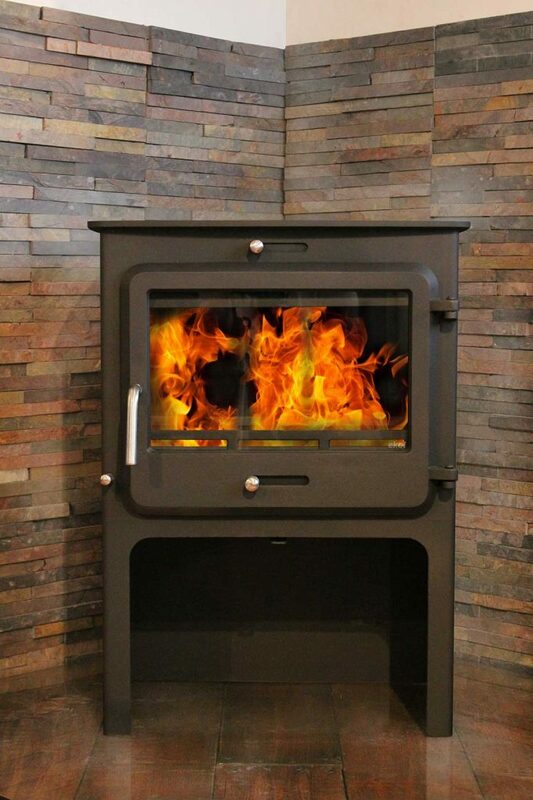 The result of extensive development, the Saltfire ST-X5 Multi Fuel Stove in Mohave Red has a large firebox allowing a greater range of heat output and larger logs to be burned, and is ultra-clean-burning with an efficiency rating of 81.8%. Constructed with a steel body and cast iron door, the ST-X5 also features the latest Air Wash technology to ensure the large glass window is kept clean and clear to allow views of the beautiful flames at all times. Designed with easy to use controls, the ST-X5 is DEFRA approved which means it can be installed into properties within Smoke Controlled areas safely and legally, and it is also EcoDesign ready to meet all 2022 regulations. The Saltfire ST-X5 Multi Fuel Stove is SIA Ecodesign Ready. The result of extensive development, the Saltfire ST-X5 Multi Fuel Stove in Light Grey has a large firebox allowing a greater range of heat output and larger logs to be burned, and is ultra-clean-burning with an efficiency rating of 81.8%. The result of extensive development, the Saltfire ST-X5 Multi Fuel Stove in Charcoal Grey has a large firebox allowing a greater range of heat output and larger logs to be burned, and is ultra-clean-burning with an efficiency rating of 81.8%. 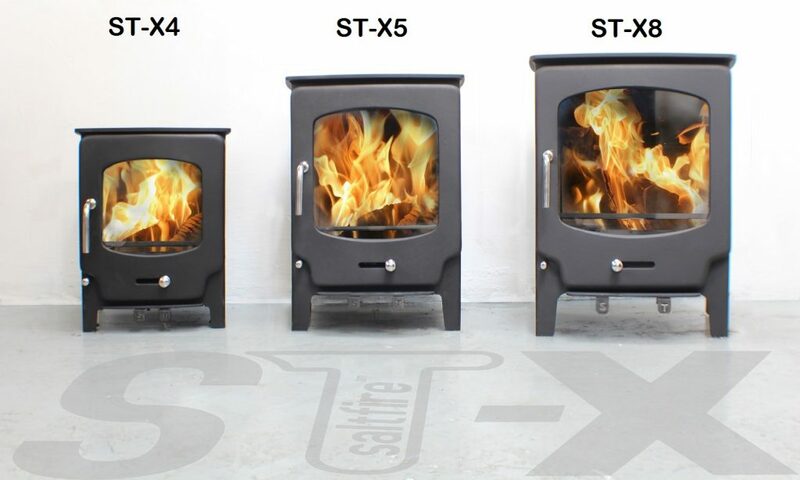 The result of extensive development, the Saltfire ST-X5 has a large firebox allowing a greater range of heat output and larger logs to be burned, and is ultra-clean-burning with an efficiency rating of 81.8%. The result of extensive development, the Saltfire ST-X4 Multi Fuel Stove in Mohave Red is the smallest in the ST-X range and is ultra-clean-burning with an efficiency rating of 79.7%. Constructed with a steel body and cast iron door, the ST-X4 also features the latest Air Wash technology to ensure the large glass window is kept clean and clear to allow views of the beautiful flames at all times. Designed with easy to use controls, the ST-X4 is also DEFRA approved which means it can be installed into properties within Smoke Controlled areas safely and legally. The Saltfire ST-X4 Multi Fuel Stove is SIA Ecodesign Ready. The result of extensive development, the Saltfire ST-X4 Multi Fuel Stove in Light Grey is the smallest in the ST-X range and is ultra-clean-burning with an efficiency rating of 79.7%. The result of extensive development, the Saltfire ST-X4 Multi Fuel Stove in Charcoal Grey is the smallest in the ST-X range and is ultra-clean-burning with an efficiency rating of 79.7%. The result of extensive development, the Saltfire ST-X4 Multi Fuel Stove in Metallic Black is the smallest in the ST-X range and is ultra-clean-burning with an efficiency rating of 79.7%. Offering a modern, contemporary design, the Saltfire ST4 Multi Fuel Stove in Mohave Red is ultra Clean Burning with an efficiency rating of 77.7%. The latest Air Wash technology helps to keep the large glass window clean and clear to ensure that you can always see the dancing flames within. The ST4 is also DEFRA approved which means it can be installed into properties within Smoke Controlled areas safely and legally. The Saltfire ST4 Multi Fuel Stove is SIA Ecodesign Ready. Offering a modern, contemporary design, the Saltfire ST4 Multi Fuel Stove in Light Grey is ultra Clean Burning with an efficiency rating of 77.7%. Offering a modern, contemporary design, the Saltfire ST4 Multi Fuel Stove in Charcoal Grey is ultra Clean Burning with an efficiency rating of 77.7%. 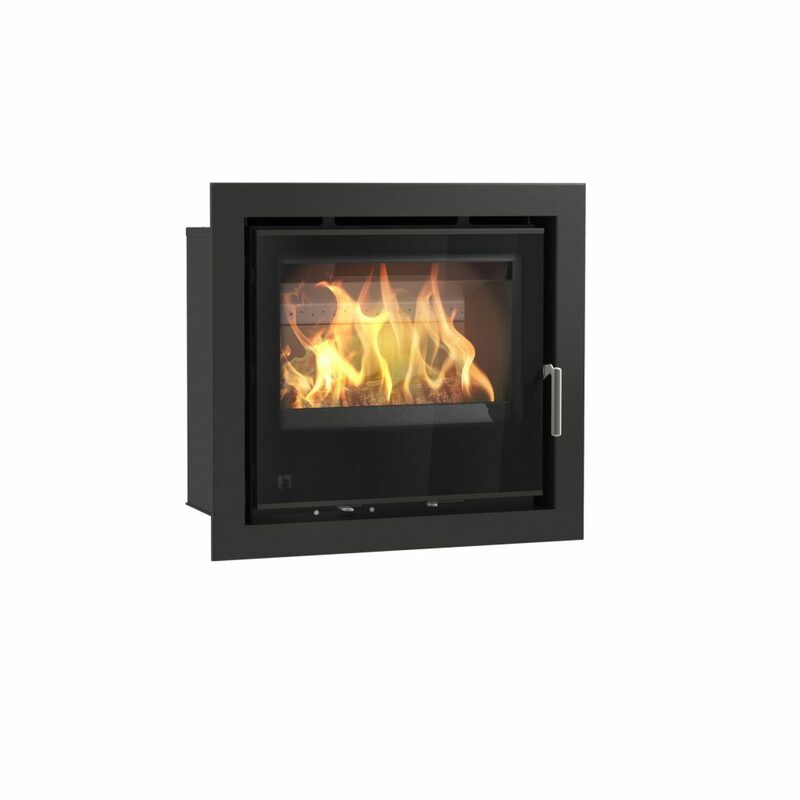 Offering a modern, contemporary design, the Saltfire ST4 Multi Fuel Stove in Metallic Black is ultra Clean Burning with an efficiency rating of 77.7%. By using the latest Air Wash technology, the large glass window on the Saltfire ST3 Wood Burning Stove in Mohave Red is kept clean and clear to allow for excellent views of the flames within at all times. The ST3 features easy to use controls with a more contemporary design that would be perfectly suited to both traditional and modern living areas. With a high efficiency rating of 73%, this ultra Clean Burning stove is also DEFRA approved which means it can be installed into properties within Smoke Controlled areas safely and legally. The Saltfire ST3 Wood Burning Stove is SIA Ecodesign Ready. By using the latest Air Wash technology, the large glass window on the Saltfire ST3 Wood Burning Stove in Light Grey is kept clean and clear to allow for excellent views of the flames within at all times. By using the latest Air Wash technology, the large glass window on the Saltfire ST3 Wood Burning Stove in Charcoal Grey is kept clean and clear to allow for excellent views of the flames within at all times. By using the latest Air Wash technology, the large glass window on the Saltfire ST3 Wood Burning Stove in Metallic Black is kept clean and clear to allow for excellent views of the flames within at all times. 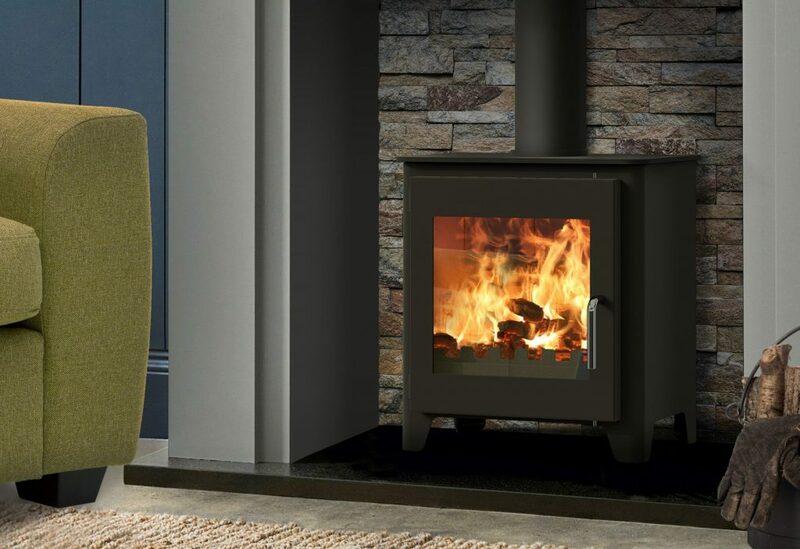 Featuring simple, easy to use controls the Saltfire ST2 Multi Fuel Stove in Mohave Red has a contemporary design which would look perfect in both traditional and more modern living areas. The latest Airwash technology ensures the large glass window is kept clean and clear, while the Cleanburn technology gives the stove an efficiency rating of 81.3% and allows it to be DEFRA approved, meaning it can be installed into properties within Smoke Controlled areas safely and legally. Please note that this stove features a non-removable Baffle Plate and so a flue pipe with door access will be required for installation. The Saltfire ST2 Multi Fuel Stove is SIA Ecodesign Ready. Featuring simple, easy to use controls the Saltfire ST2 Multi Fuel Stove in Light Grey has a contemporary design which would look perfect in both traditional and more modern living areas. The latest Airwash technology ensures the large glass window is kept clean and clear, while the Cleanburn technology gives the stove an efficiency rating of 81.3% and allows it to be DEFRA approved, meaning it can be installed into properties within Smoke Controlled areas safely and legally.Please note that this stove features a non-removable Baffle Plate and so a flue pipe with door access will be required for installation. Featuring simple, easy to use controls the Saltfire ST2 Multi Fuel Stove in Charcoal Grey has a contemporary design which would look perfect in both traditional and more modern living areas. 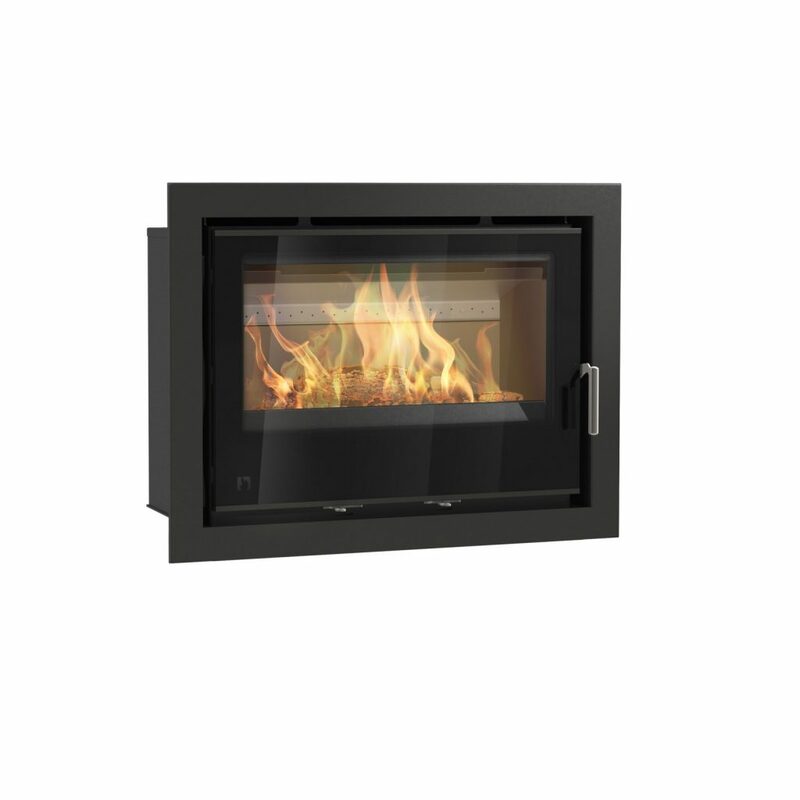 Featuring simple, easy to use controls the Saltfire ST2 Multi Fuel Stove in Metallic Black has a contemporary design which would look perfect in both traditional and more modern living areas. 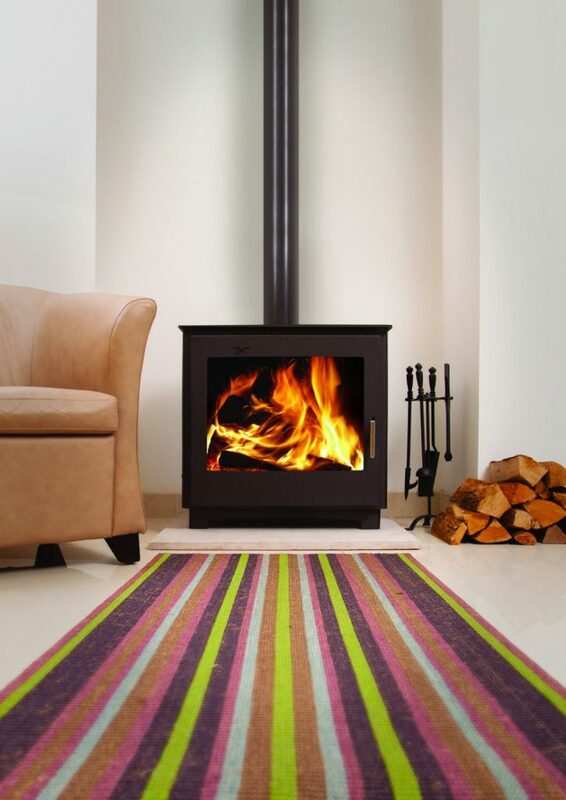 The Saltfire ST1 Vision Wood Burning Stove in Mohave Red is one of the most efficient, clean burning stoves available and has been designed with easy to use controls to make operating simple and hassle-free. The large glass window is kept clean and clear thanks to the latest Airwash technology to ensure that you can always see the dancing flames within. The Saltfire ST1 Vision Wood Burning Stove in Light Grey is one of the most efficient, clean burning stoves available and has been designed with easy to use controls to make operating simple and hassle-free. The Saltfire ST1 Vision Wood Burning Stove in Charcoal Grey is one of the most efficient, clean burning stoves available and has been designed with easy to use controls to make operating simple and hassle-free. The Saltfire ST1 Vision Wood Burning Stove in Metallic Black is one of the most efficient, clean burning stoves available and has been designed with easy to use controls to make operating simple and hassle-free. 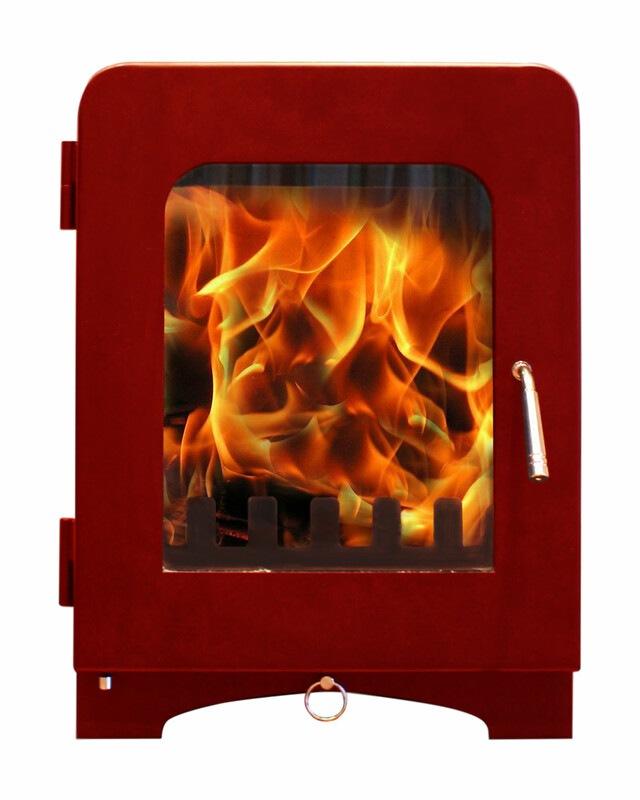 The Saltfire ST1 Wood Burning Stove in Mohave Red is one of the most efficient, clean burning stoves available and has been designed with easy to use controls to make operating simple and hassle-free. The Saltfire ST1 Wood Burning Stove is SIA Ecodesign Ready. The Saltfire ST1 Wood Burning Stove in Light Grey is one of the most efficient, clean burning stoves available and has been designed with easy to use controls to make operating simple and hassle-free. The Saltfire ST1 Wood Burning Stove in Charcoal Grey is one of the most efficient, clean burning stoves available and has been designed with easy to use controls to make operating simple and hassle-free. The Saltfire ST1 Wood Burning Stove in Metallic Black is one of the most efficient, clean burning stoves available and has been designed with easy to use controls to make operating simple and hassle-free. 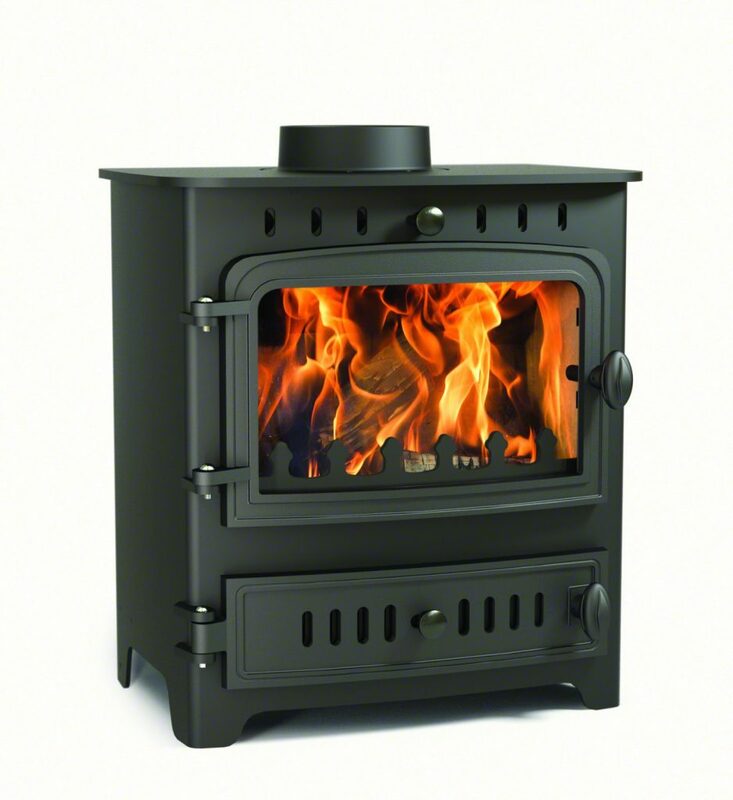 As the new heating season approaches we continue to expand our range of stoves and fires both in store and online. One such addition is the new Ekol range of Ultra Clean Stoves. Ekol stoves have been developed from a desire to create truly environmentally friendly Wood Burning and Multifuel stoves, with the entirety of the range boasting Defra approval which allows these beautiful fires to be used within Smoke Controlled Areas whilst giving peace of mind that your new stove is burning cleanly and efficiently. Ekol stoves feature a pre-heated Tertiary Air System, which ensures that the combustion gases within the firebox do not solidify, creating a cleaner burn when compared to other modern stoves using an Airwash System. Wood Burning with Ekol Cleanburn Technology has never been easier. With three sets of Air Supply Vents giving you maximum control, the firebox Air supply is quickly brought up to temperature allowing the stove to rapidly get to its most efficient operating temperature making it easy to get going and to maintain and refuel the fire. The addition of a Hot Air Injection System creates a mesmerising dancing flame effect for complete control over the fire within. The Ekol Crystal and Clarity stove ranges feature an extended 5-year manufacturer backed warranty, whereas the stunning new Ekol Adept range come complete with a full 10-year warranty when purchased through an authorised stockist such as Simply Stoves. This exciting new range of clean burning Wood Burning and Multifuel stoves are available now both in store and online, use code GIVEME5 when ordering online to grab an additional 5% discount throughout July and August. Designed to fit into a standard fireplace opening with fireback removed, the Ekol Inset 8 Multi Fuel Stove in Light Ivory Enamel features the latest Cleanburn and Airwash technology to keep the large glass window clean and clear. Defra approval means the Inset 8 can also be installed into properties within Smoke Controlled areas safely and legally. Designed to fit into a standard fireplace opening with fireback removed, the Ekol Inset 8 Multi Fuel Stove in Gloss Black Enamel features the latest Cleanburn and Airwash technology to keep the large glass window clean and clear. Designed to fit into a standard fireplace opening with fireback removed, the Ekol Inset 8 Multi Fuel Stove in Deep Red Enamel features the latest Cleanburn and Airwash technology to keep the large glass window clean and clear. Designed to fit into a standard fireplace opening with fireback removed, the Ekol Inset 8 Multi Fuel Stove in Matt Black features the latest Cleanburn and Airwash technology to keep the large glass window clean and clear. Designed to fit into a standard fireplace opening with fireback removed, the Ekol Inset 5 Multi Fuel Stove in Light Ivory Enamel features the latest Cleanburn and Airwash technology to keep the large glass window clean and clear. Defra approval means the Inset 5 can also be installed into properties within Smoke Controlled areas safely and legally. Designed to fit into a standard fireplace opening with fireback removed, the Ekol Inset 5 Multi Fuel Stove in Gloss Black Enamel features the latest Cleanburn and Airwash technology to keep the large glass window clean and clear. Designed to fit into a standard fireplace opening with fireback removed, the Ekol Inset 5 Multi Fuel Stove in Deep Red Enamel features the latest Cleanburn and Airwash technology to keep the large glass window clean and clear. Designed to fit into a standard fireplace opening with fireback removed, the Ekol Inset 5 Multi Fuel Stove in Matt Black features the latest Cleanburn and Airwash technology to keep the large glass window clean and clear. 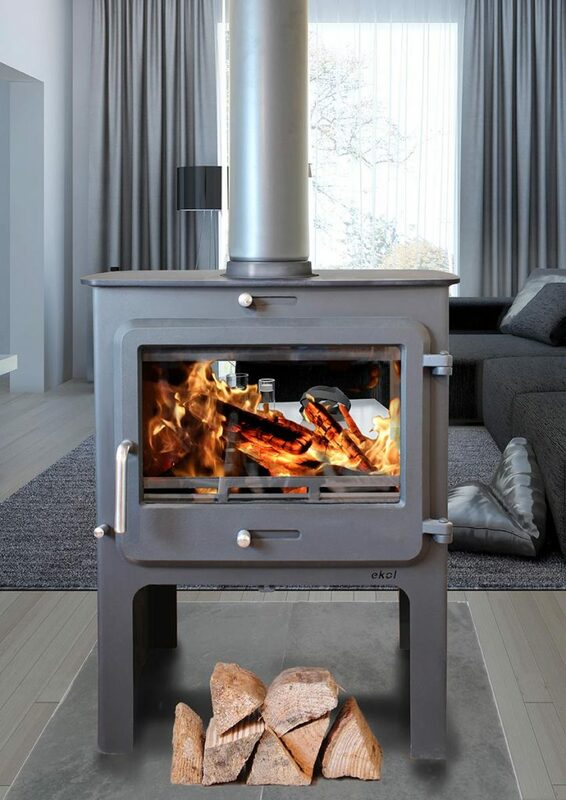 The Ekol Clarity 12 High Autoblaze Multi Fuel Stove is a version of the Clarity 12 stove that has been equipped with a revolutionary automatic stove ignition system. The Autoblaze has been invented to make stove lighting even easier and can create a fully established fire in as little as 3 minutes with no small kindling or chemical firelighters. The Autoblaze system sits neatly on the back of the stove and is powered by any standard 240v socket. 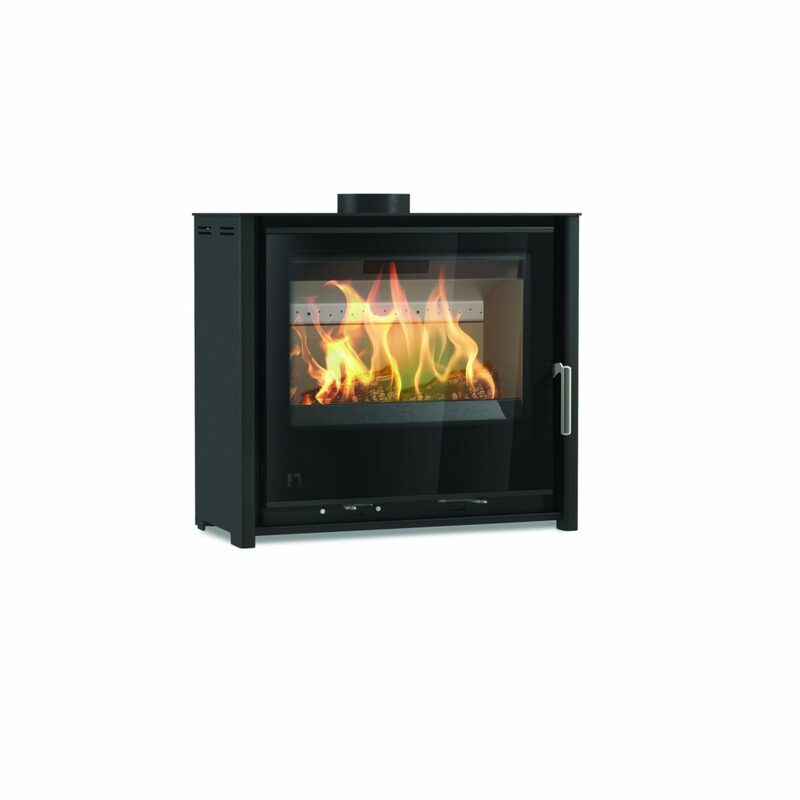 Easy to use with remote control and button operated backup on the stove itself, the Autoblaze can also solve many issues associated with weak drawing chimneys, quickly heating the flue for a strong and consistent draught. The Ekol Clarity 12 Autoblaze Multi Fuel Stove is a version of the Clarity 12 stove that has been equipped with a revolutionary automatic stove ignition system. The Ekol Clarity 30 Multi Fuel Boiler Stove is capable of providing hot water and central heating for up to 18 radiators when burning anthracite. Also suitable to burn logs, the Clarity 30 Boiler Stove is Defra approved which means it can be installed into properties within Smoke Controlled areas safely and legally. The Ekol Clarity 20 Multi Fuel Boiler Stove is capable of providing hot water and central heating for up to 12 radiators when burning anthracite. Also suitable to burn logs, the Clarity 20 Boiler Stove is Defra approved which means it can be installed into properties within Smoke Controlled areas safely and legally. The Ekol Clarity Double Sided High Multi Fuel Stove was the first double sided stove to be granted Defra approval, which means it can be installed into properties within Smoke Controlled areas safely and legally. Featuring the latest Airwash technology to keep the large glass windows clean and clear on both sides, the Clarity Double Sided is the perfect stove to install to bridge two rooms through a central chimney, or as a stunning centrepiece when installed free standing in any room. The Ekol Clarity Double Sided Multi Fuel Stove was the first double sided stove to be granted Defra approval, which means it can be installed into properties within Smoke Controlled areas safely and legally. The Ultra-Clean Burning Ekol Clarity 12 High Multi Fuel Stove is Defra approved meaning it can be installed into properties within Smoke Controlled areas safely and legally. Featuring the latest Airwash technology to keep the glass clean and clear, the Clarity 12 is easy to use, highly efficient and the unique flame pattern to keep you mesmerised. The Ultra-Clean Burning Ekol Clarity 12 Multi Fuel Stove is Defra approved meaning it can be installed into properties within Smoke Controlled areas safely and legally. The Ultra-Clean Burning Ekol Clarity 8 High Multi Fuel Stove is Defra approved meaning it can be installed into properties within Smoke Controlled areas safely and legally. Featuring the latest Airwash technology to keep the glass clean and clear, the Clarity 8 is easy to use, highly efficient and the unique flame pattern to keep you mesmerised. The Ultra-Clean Burning Ekol Clarity 8 Multi Fuel Stove is Defra approved meaning it can be installed into properties within Smoke Controlled areas safely and legally. The Ekol Clarity Vision High Multi Fuel Stove has been designed to provide the widest view of the fire whilst staying at a 5kW heat output. Based on the dimensions of the Clarity 12, the Clarity Vision has a shallower depth, allowing for easier installation into shallow fireplaces or less intrusion if installing as free standing against a wall. 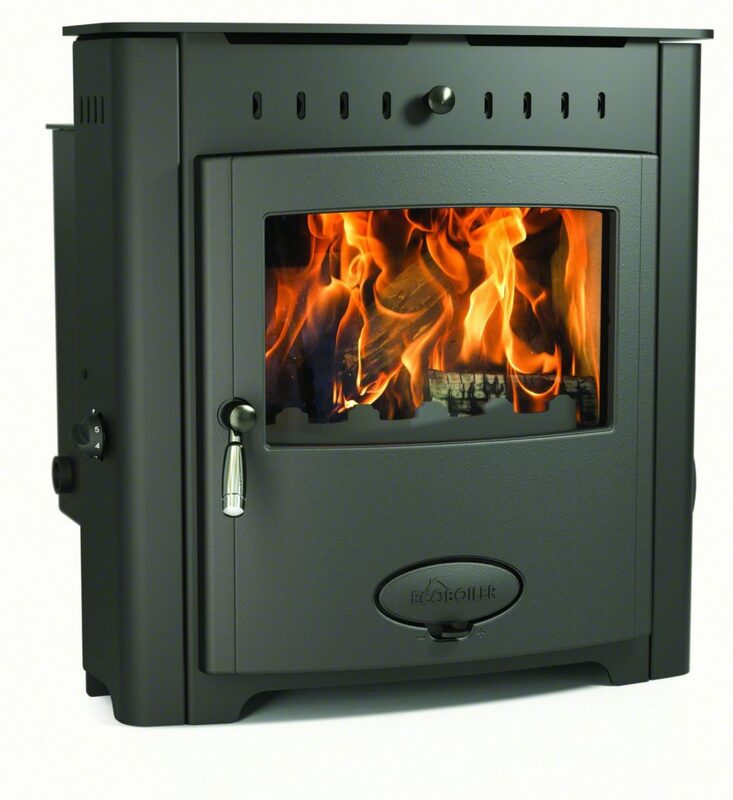 The Ekol Clarity Vision High Multi Fuel Stove is SIA Ecodesign Ready. The Ekol Clarity Vision High Wood Burning Stove has been designed to provide the widest view of the fire whilst staying at a 5kW heat output. 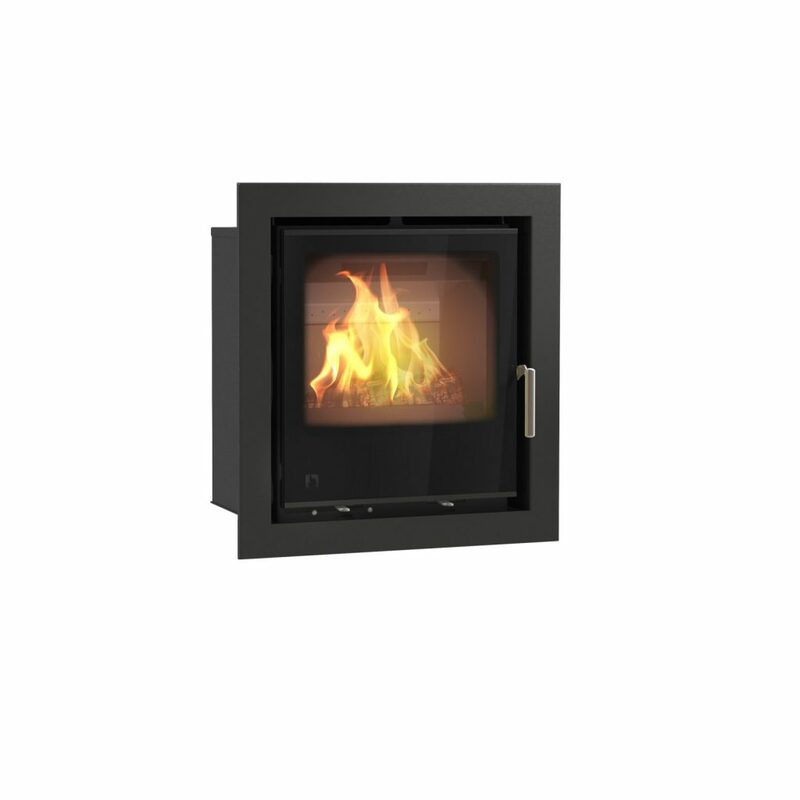 The Ekol Clarity Vision High Wood Burning Stove is SIA Ecodesign Ready. The Ekol Clarity Vision Multi Fuel Stove has been designed to provide the widest view of the fire whilst staying at a 5kW heat output. The Ekol Clarity Vision Multi Fuel Stove is SIA Ecodesign Ready. The Ekol Clarity Vision Wood Burning Stove has been designed to provide the widest view of the fire whilst staying at a 5kW heat output. Based on the dimensions of the Clarity 12, the Clarity Vision has a shallower depth, allowing for easier installation into shallow fireplaces. 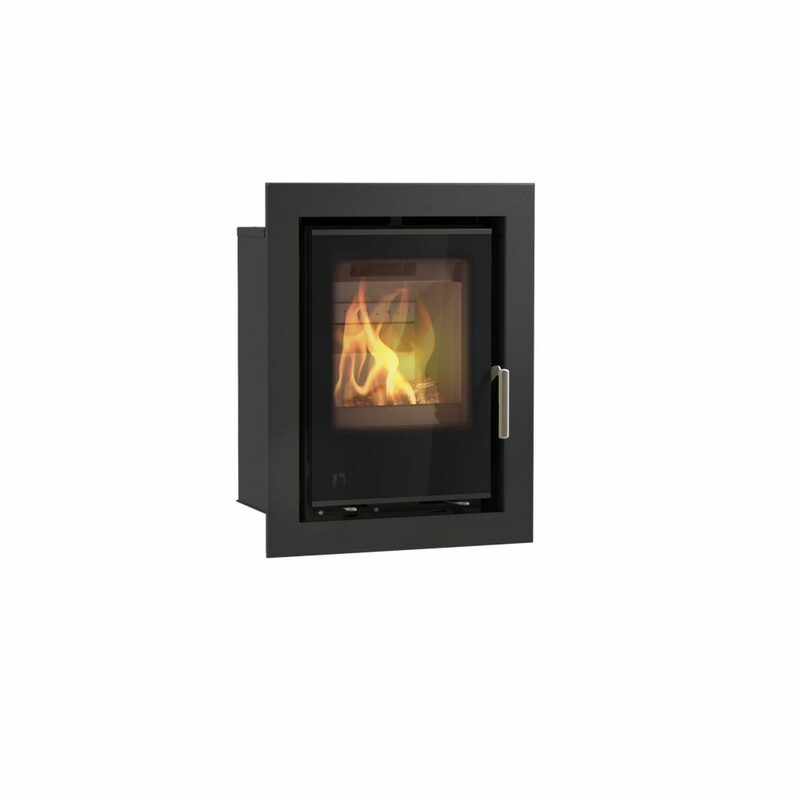 The Ekol Clarity Vision Wood Burning Stove is SIA Ecodesign Ready. The Ultra-Clean Burning Ekol Clarity 5 Stove is Defra approved meaning it can be installed into properties within Smoke Controlled areas safely and legally. Featuring the latest Airwash technology to keep the glass clean and clear, the Clarity 5 is easy to use, highly efficient and the unique flame pattern to keep you mesmerised. The Ekol Clarity 5 High Multi Fuel Stove is SIA Ecodesign Ready. The Ekol Clarity 5 Multi Fuel Stove is SIA Ecodesign Ready. Hand-made with traditional solid cast iron, the Ekol Crystal 12 Multi Fuel Stove is highly efficient, simple to operate and uses the latest Cleanburn and Airwash technology. 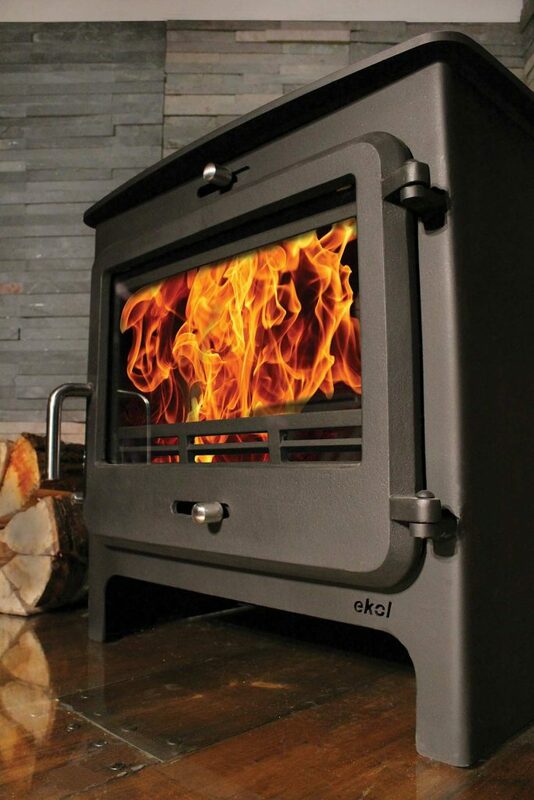 Hand-made with traditional solid cast iron, the Ekol Crystal 8 Multi Fuel Stove is highly efficient, simple to operate and uses the latest Cleanburn and Airwash technology. Hand-made with traditional solid cast iron, the Ekol Crystal 5 Multi Fuel Stove is highly efficient, simple to operate and uses the latest Cleanburn and Airwash technology. The Crystal 5 is also one of the few stoves in the UK capable of being installed into a standard 16″ wide fireplace opening. The Ekol Crystal 5 Multi Fuel Stove is SIA Ecodesign Ready. 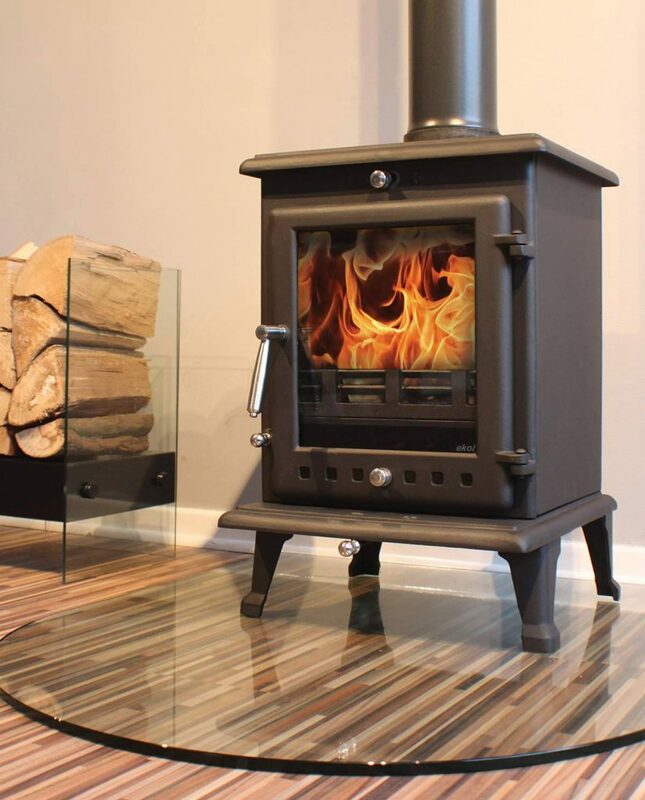 Started in 2009, Simply Stoves Limited is a company dedicated to the supply and installation of Wood Burning and Multifuel stoves across the UK. Our vision as a company has always been to supply high quality products and service at prices to suit all budgets, with huge increases in Gas, Electric and Oil prices more people are turning to new, efficient Wood and Multifuel appliances to heat their homes. Hetas engineers working closely with Simply Stoves are all trusted friends of the company and have the experience and knowledge to carry out any installation required, from a straight forward stove installation to the re-building of an entire chimney stack. All of the engineers offer a FREE on site quotation within your property and will often give suggestions and recommendations based on our customers individual requirements. Call us today for a friendly no pressure chat or alternatively visit us at our High Street Showroom. 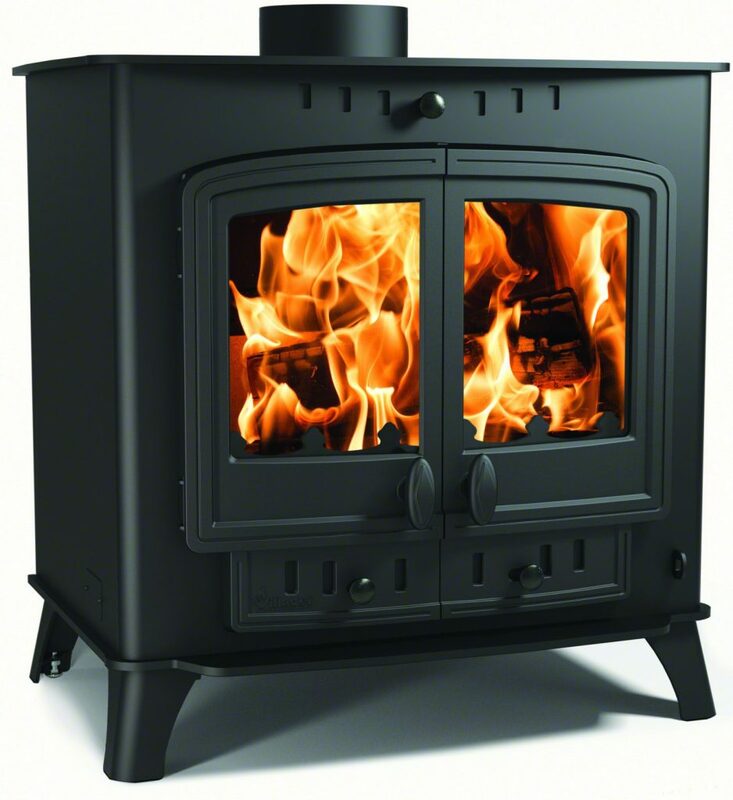 All of the stoves offered for sale whether it be from our Showroom or online website have been handpicked for the highest quality and efficiency at competitive prices to suit all budgets. Contact us today to arrange your visit with one of our experts in the Showroom or alternatively let us come to you! Really good service from first contact to final fitting of stove, Chris was imformative and helpful. Fitters were brilliant, would recommend the whole team at Simply Stoves. Fantastic service! We ordered a Stovax stove and Chris arranged for the installation to be completed. We couldn’t be happier with the service from the shop or the installation team.Would recommend to friends and family without any hesitation. Fast delivery and excellent customer service. Chris at Simply Stoves advice was second to none. We receieved an accurate and reasonable quote and the installation was very neat. Would highly recommend and have already passed your details onto a number of my neighbours. Thank you! Very friendly and helpful, I bought a 7.3KW Carron which was delivered next day for no extra cost. Brilliant. Really pleased with our hobbit stove, it looks lovely. 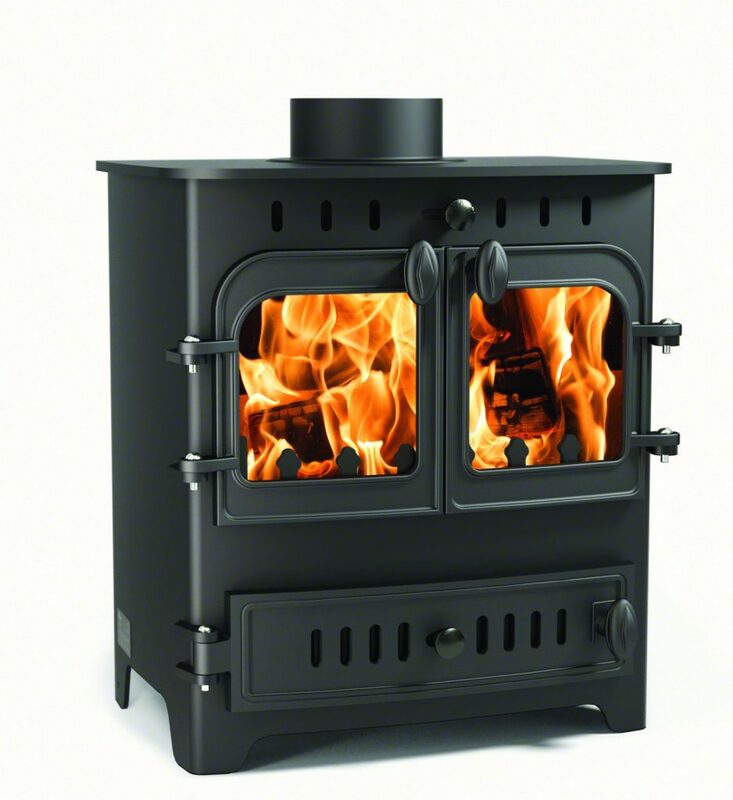 Impressed with service recieved and would highly recommend Simply Stoves to family and friends. Not fitted the fireplace yet but kust wanted to say service has been excellent. Chap on the phone was patient and called me back straight away with the information i needed. Great value as well nearly went and paid £899 before i come across Simply Stoves. The fireplace and stove we purchased from Chris at Simply Stoves is now installed. We are both delighted with the results, not only of the goods we purchased but the service we have had. The fitters we had recommended by Chris were superb and the help and advice given has been a real help. All in all a joy to deal with and would highly recommend Simply Stoves.